Those who serve as Eucharistic Ministers are part of a most beautiful ministry. During the Communion Rite, the heart of our liturgy, these members of the assembly bring the Body and Blood of Christ to the People of God. Their grace in movement and reverence in gesture tell us that this is a very special moment. As hosts and servants at the Eucharistic banquet, they remind us that our communion with the Lord is also communion with one another. 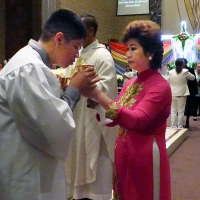 In addition to Sunday Mass (English, Spanish, Vietnamese), ministers from all three communities volunteer to serve at weekday Masses, on holy days, Ash Wednesday, during the Triduum, at the Christmas Masses, and at special Masses throughout the year. The required training focuses on the spirituality of this ministry, liturgical procedures, and individual responsibilities and duties. Training sessions are announced well in advance.